Last week a study at the always-flowing Ivishak hot spring passed a major milestone—the camp infrastructure placed at the site to support year-round visits by the research team was removed. For three years, scientists led by Alex Huryn of U Alabama have made near-monthly visits to the site for a study of seasonal ecosystem changes in the perennial spring. The scientists have travelled to the remote site each time by helicopter, even in the dark of winter. Winter visits are now over, and Huryn will make his last visit under his NSF grant in August, so last week two CPS staffers visited the site to remove infrastructure placed there to support the team in the event of winter storms or air support delays. 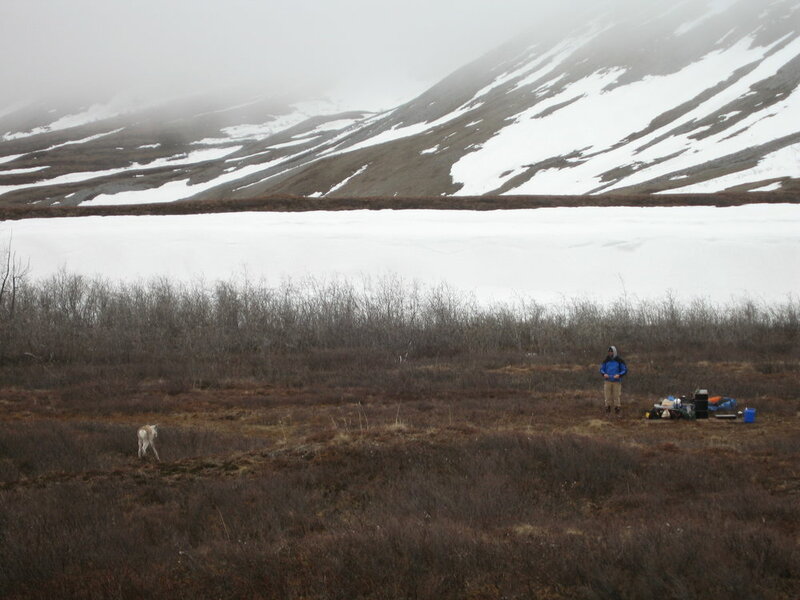 PFS field manager Matt Irinaga and assistant Erik Lund drove from the PFS office in Fairbanks to Toolik Field Station, where they flew by helicopter to Ivishak. The team arrived at Ivishak spring in fine sunshine, with snow capped mountains framing the view. They met Huryn and colleagues Stephanie Parker and James Ramsey, there finishing up the ongoing fish, water, and sediment sampling and instrument maintenance. Matt reports that Alex was very happy, having finally encountered two river otters that had for two years been leaving calling cards while eluding face-to-face visits while the science team was in the field. In addition to river otters, the field party saw abundant wildlife, “everything but wolves,” Erik Lund reported. 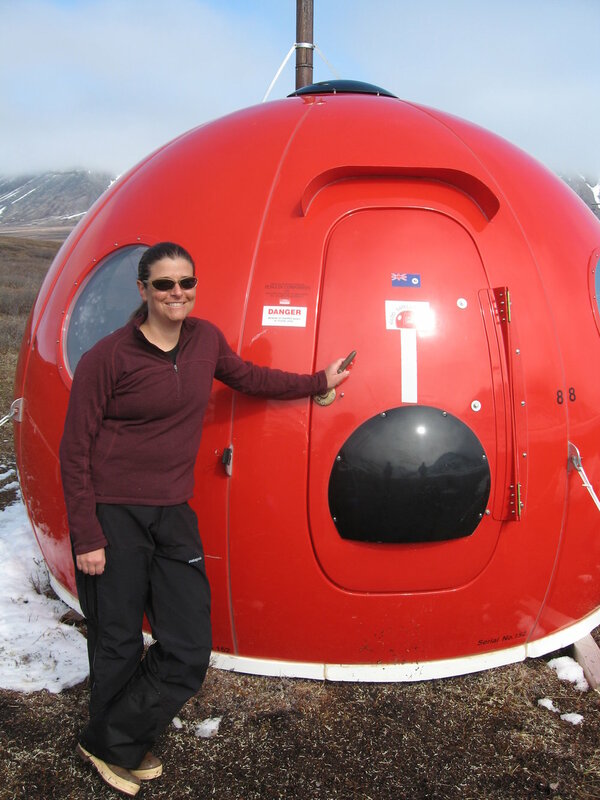 The research team departed in the afternoon, and the CPS team broke down the camp, managing to fly two loads of gear, including the tomato-looking Igloo, back to Toolik Field Station. With the helicopter pilot running low on duty time, Matt and Erik made camp and stayed for the night. Weather turned during the evening, and Saturday dawned with low skies and snow flurries, delaying completion of the take out by a few hours. But Matt says he and Erik hunkered down and enjoyed a continuing parade of wildlife. In all, they saw four bears, Dall sheep, moose, a myriad of birds, and caribou. 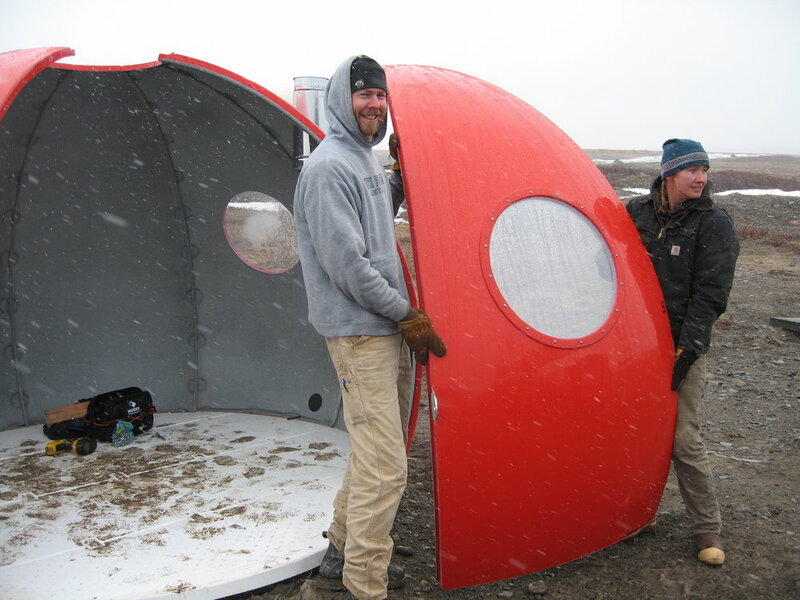 Back at Toolik, Erik Lund and Annelisa Neely break down the Igloo.